There's been so much rumor-hawking and speculation the past few weeks that whether you're ready or not, we're squarely in the middle of iPhone season. So here's a quick rundown of everything we think we know about Apple's next iPhone. We think we have a pretty good idea of what the new iPhone will look like; we've been seeing leaked parts for months now, and recently that has moved up to fully assembled phones, and possibly a whole phone smuggled out of a plant. The phone will reportedly be a unibody design, with a two-tone back, and come in both black and white. And it turns out, all of the leaked internals fit perfectly into the leaked outer casing. Want proof beyond the leaked parts, though? How about Apple ramping up its long-term component contracts at a massive level. That is almost certain to mean new, different-looking products. It could be the iPad Mini, but the step up is large enough for it to be behind two new products. Additionally, iOS 6 scales to the exact resolution that the rumored 4-inch screen would have—and only to that resolution. There would be little reason for Apple to add support for 640x1136 screens if it had no plans on making them a reality. First and most obviously, the display is probably going to be four inches, and 16:9. We've heard this again and again, and iMore's report today suggests that's the configuration that Apple's locked into. On a technical level, though, the iPhone is probably going to use Sharp's IGZO display technology. IGZO screens are thinner, because they use smaller transistors, allowing more light to pass through. That means they use fewer LEDs, and therefore take up less space and consume less power. We all know that the next iPhone will come with iOS 6. And we've learned a good deal about Apple's next mobile OS, too, since it was announced at WWDC in June. It will feature Apple's own mapping system, as well as some pretty cool new features like Passbook. Traditionally, we get an early look at the new iOS during WWDC, and then get the full dose of it when the new iPhone comes out. This year, if reports are to be believed, we'll also be getting an iPad Mini at the same time, so there could be some differences across devices. But we'll absolutely have the final versions of all the new features. All signs point to the new iPhone having a smaller dock connector. The latest reports are saying it'll be called a Lightning connector, and look basically the same as all the leaks we've seen. Like the move to MagSafe 2 adapters, the reported new 19-pin dock connector is a necessity. And it has been for two years, at least, when the iPod Touch reached critical thinness mass. And if you're really that upset about all of your peripherals, dollars to dock connectors says there will be some kind of converter—like with the MagSafe. It might even be compatible with micro USB (though almost definitely not, in all likelihood). Apple MagSafe to MagSafe 2 Converter Review: Couldn&apos;t We Like Tape This Thing on or Something? Tiny MagSafe. Tinier MagSafe! Really tiny converter. LET&apos;S DISCUSS. There's also word coming from iLounge that the new dock connector will be an insanely small 8 pins, but that seems unlikely because each pin has a separate function, and 8 would limit the functionality of the connector. Beyond the dock connector, there's also a hopeful little rumor out there that the notoriously terrible Apple earbuds might get an upgrade. Those reports were bolstered this morning, when the name "Earpods" was dropped, along with a $30 pricetag. No word on if they'll come standard, though. Will Apple Intro New (Less Terrible) Headphones With Its New iPhone? It would be hugely surprising if the new iPhone doesn't have 4G LTE. Not only because of the necessity of keeping up with Android and even Windows Phone, but because Apple has been reportedly installing LTE equipment in its stores since last year. And now it's basically been confirmed by the Apple internal search engine's references to an LTE iPhone. Is Apple Secretly Installing LTE Equipment at Apple Stores? Battery life is also a factor. The IGZO screen's low power consumption, as well as the extra space in the body afforded by the longer, thinner screen, would allow for the iPhone to have a big, long-lasting battery. That's important. Until now, one of the main reasons Apple hasn't pulled the trigger on LTE is that the hyperspeed connections would have drained the iPhone's battery too quickly. Apple has always prized battery life in its devices, and there was no was it was going to ship an LTE iPhone that couldn't last a whole day on one charge. Although if the leaked battery that turned up a while back is any indicator, the battery isn't all that much bigger. 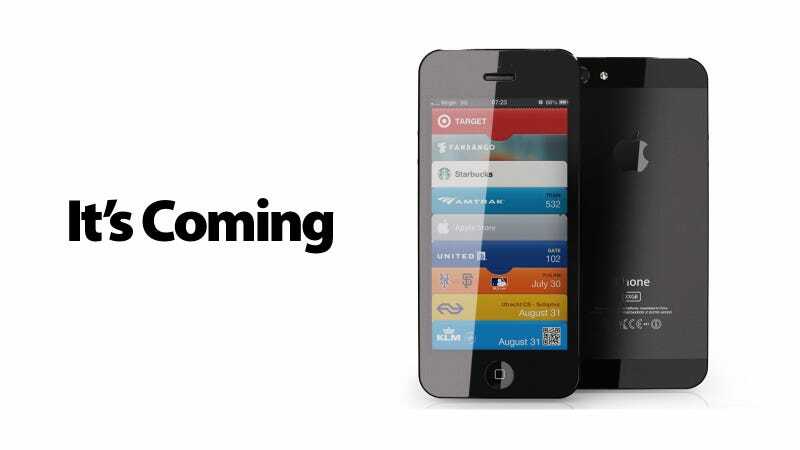 There had been some rumors about the new iPhone having NFC, but at this point, they seem like a total long shot. Passbook in iOS 6 seems like a natural fit for NFC. But after a false alarm that the leaked internals showed an NFC chip, it turned out that's highly unlikely. Thing is, no one's really drooling over NFC right now. Not like they are for LTE speeds. Apple probably has the muscle to push its own NFC venture through the carriers, unlike Google Wallet. But while it makes perfect sense to pair a mobile payment system like Passbook with NFC, if demand isn't there, there's not much reason to stick its nose in the fire. Even Apple's WWDC announcement of Passbook made it seem like we'd be without NFC for a while. So don't count on it making an appearance this year. Word is, Apple is ditching the Audience tech that powers the current version of Siri. But we don't have any information about what this means for the Siri feature. Given how strong the push was, though, it's a good bet that Apple's found something it thinks is better, and is going with that. The official announcement will be on the 12th. There is also a report from iMore that the iPhone will be announced alongside a new iPad Mini on September 12th, and released on the 21st. The announcement will be about a month earlier than the presumed October announcement and release, which would have been a year after the 4S. But it also makes sense, since the iPhone 4S has lost a lot of momentum the past few months, since everyone's already talking about its successor. Looks like it actually is called the iPhone 5. The shadow under the official announcement image from Apple shows a large 5. So there that is, even if it doesn't make a whole lot of sense. That was further confirmed this morning when leaks from Apple's internal search started popping out references to the iPhone 5. Of course, none of this matters if you can't actually get your hands on one to buy. Word is, Sharp, one of the main display manufacturers for Apple products, is having a hard time meeting demands, possibly shutting down manufacturing entirely. That would seriously hamper the number of phones available, and possibly make them a hard ticket to come by. Also, it seems that T-Mobile probably won't get the iPhone. Again. Ha ha T-Mobile. Cost-wise, the iPhone 5 is reportedly the same price as the 4S. That means it should start at $200 and scale up by $100 for every storage increment. Of course, this could all be totally wrong. As we saw from the cache of iPhone prototypes last week, Apple works on multiple designs at once. So while it seems unlikely, the final released design could be totally different from what we've been seeing for the past several months. But it's way more likely that this is the iPhone that's going to land in our laps in about seven weeks.